Emiliano Aguilar Jr. is a second-year doctoral student in History. A native to East Chicago, Indiana he attended Wabash College in Crawfordsville, IN and majored in English and History. After completing his undergraduate degree, he attended Purdue University and earned his M.A. in History. While working towards his M.A., Emiliano served as an instructor for Purdue University’s Upward Bound Program, which he was also a participant of while a high school student. 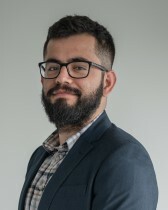 Emiliano’s research interests include the Latinx Midwest and the political development of the community within Northwest Indiana, primarily East Chicago. His work deals with how various Latinx communities formed home and gained representation within the municipal sphere of politics. Outside of his work, Emiliano is an avid reader and enjoys pulp fantasy novels and the works of Ernest Hemingway, Kurt Vonnegut, and Luis Alberto Urrea. Outside of these interests he is also a tabletop gaming enthusiast and enjoys home brewing.